For the Molé Madness challenge I need to come up with a new recipe each week using Indi Chocolate Molé Rub. Last week Becca won big time by using molé bacon in her recipe! This week I'm upping my game with fire. 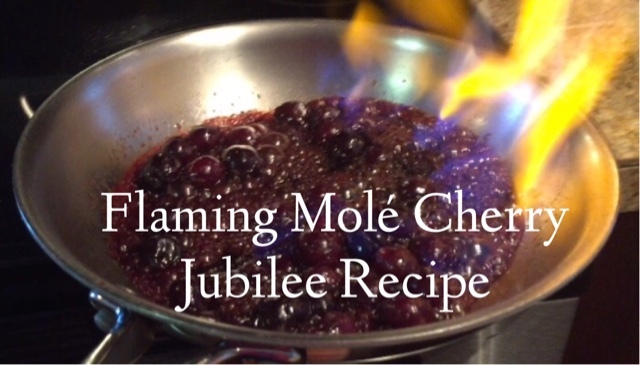 Who doesn't like a big flaming pan of cherries? Vote for my recipe by liking and sharing this post as well as the posts about it on all my social channels (Instagram, Twitter, Facebook are the main ones). light it on fire. The flames will be about 2 feet high so make sure you don't hurt yourself or anyone else. When the fire dies down spoon over vanilla ice cream (although I think chocolate ice cream would be a better choice). Stay tuned, tomorrow I'll be posting about how to taste 100% chocolate without overwhelming your palate. One hundred percent can be intense! !